Ana from INCARNATE wears a lot of woolen items. (I’m not sure where she gets that from.) Hats, socks, mittens, scarves . . . and my favorite, fingerless mitts. I’ve knit dozens of fingerless mittens to give away, but I can’t possibly knit enough for everyone and their cold hands. After much trial, and with much help from knitting friends, I have converted the pattern in my head to pattern on (virtual) paper. I now have all new appreciation for actual knitting designers. These mitts are for advanced beginners. You’ll need to know how to knit cables, read a chart, and knit in the round. If you need links for learning to knit, I love KnittingHelp.com, Ravelry, and Knitty.com. I think of these mitts as having two sides: palm side and pattern side. The pattern side will be the Hourglass Cable from Gabriella Chiarenza’s Celsidra socks, featured in Knitty’s Spring 2007 issue. Since the chart isn’t mine (neither is the cable pattern, for that matter), you’ll have to click over to the Knitty site for that part of the pattern. The abbreviations and special instructions for the cables are at the top of the sock pattern page. If you don’t know how to read a chart, don’t be afraid. Start on the bottom right, work left, then move up to the next line. The cable pattern begins immediately on needles 3 and 4, and continues to the top of the mitt. I use the pattern repeats to help me figure out what part of the palm side I’m on. Join for knitting in the round, and for the love of commas, don’t twist the stitches. Round 1: PM for beginning of round, [knit 1, purl 1] 12 times, knit, (end of palm side, beginning pattern side) PM, purl 2, knit 2, purl 6, knit 4, purl 6, knit 2, purl 2. Round 2 through 24: Continue as established with 1×1 ribbing on palm side and following Hourglass Cable on patterned side for two repeats. Round 25 though 36: Knit to second marker, continue Hourglass Cable. End on Round 52 (row 4 of the Hourglass Cable) with 15 stitches between the markers. 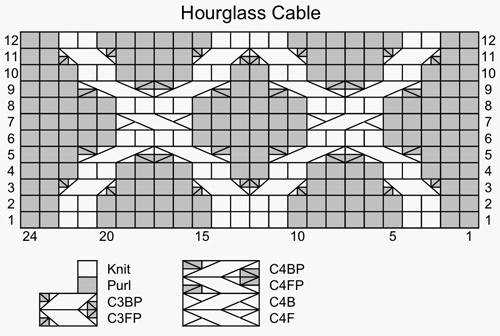 Continue as established until you have completed five repeats of the Hourglass Cable chart. When you begin the sixth repeat, begin knitting palm stitches in 1×1 rib ending with a knit stitch. Bind off loosely. Knit five rounds and bind off loosely. Weave in all ends. Wear. Stop having cold hands. The Hourglass Cable takes a little figuring out, but it really is worth it! thank you! i am definitely queuing these. when my hand heals, I will have to give this a try. But I should probably do the button up scarf I have planned first. Such a cute pattern and my hands will thank you. Finially finished my mitts… the last step is particularly important. :) I’m excited to start using them as I launch into my third reading of Incarnate… my old fingerless mitts were too short both on the wrist and the finger end, so my hands were still cold-ish when I used them. Oh, I forgot that? Ooops! *adds it* Thanks. And ahhh, thanks for reading INCARNATE!